Getting engaged is one of the most exciting times in your life. For most, the moment they’re engaged also marks the moment they begin planning their wedding. Wedding planning is not quick process, however, in fact, it usually takes significant time and money. After all, what’s deemed as the biggest day of your life should no doubt be spectacular, right? That being said, a big, expensive wedding isn’t necessarily what each couple wants or, in some cases, what they can really afford. Enter the idea of elopement. What used to be the choice of only a select few is becoming more and more popular. Couples are seeking to take some of the stress out of the ceremony and to save money in the long-run. If you’re considering eloping, you might be wondering if it’s worth it. Does it really save you money or is it worth it to spend a little extra on a larger affair? Before making your decision, take a look at these ways eloping could affect your budget. There’s no shortage of expenses when it comes to a wedding. From the dress and attire to the food, flowers, photographer, and venue, paying for all the aspects of a wedding can reach into the tens of thousands of dollars. That being said, the more guests you have, the more you’re going to have to pay for each of these things. More guests equates to a bigger venue, which usually comes at a higher price, ergo you’ll have spend more on decorations in order to accommodate the larger venue. Furthermore, food and cake aren’t cheap to begin with, so if you’re paying for 100 guests plated dinners and dessert you can’t expect to spend a large amount. Eloping on the other hand, eliminates most if not all of these costs. Even if you did have a small ceremony, the amount you’d spend on an intimate venue and food for ten (if that) is going to be far more inexpensive. For many couples one of the perks of a wedding is all the gifts. Yes, there’s much more to your special day than that. However, for some couples, the gifts are important, especially to those just starting out at a younger age who are in need of items for their home. Often times, the gifts you’ve registered for can account for thousands of dollars in home goods you’d otherwise have had to purchase yourself. While elopement could save you money on the wedding, you may in turn have to spend more money on home goods you would have received as wedding gifts. While that’s not to say you won’t still receive gifts if you elope, it does mean people might not be as generous as they would have if they’d gone to your wedding or feel quite as obligated to give a gift if you elope. Weddings are inherently expensive even when you’re having a smaller ceremony. Many couples wedding expenses can accumulate into the tens of thousands of dollars quicker than they realize. Although setting aside your budget beforehand is one way to try to stick with what you can afford, it’s not always a full-proof method. Ergo, come the end of their wedding day, some people find themselves in a fair amount of debt. Combine that with any debt already and you could find yourself in a bit of a financial hole. As mentioned, eloping brings down the cost of your wedding by a significant amount. So, come your wedding day you’ll be able to actually enjoy yourself without worrying about all the debt you’ll have to pay for after. As a newly married couple, you’ll most likely have an array of new financial and life goals to work towards. From buying a home to purchasing a car, saving for your dream vacation, putting kids through college, and retirement, life will come with a variety of expenses. While your wedding is a very special day, it’s not the only thing to save up for in life. Eloping could set you off on the right track to accomplish those financial goals that much sooner. Instead of investing in a dress or venue, you can start saving money from the get-go. You can begin accumulating interest for your future expenses. Not only could you save enough to reach those goals earlier, but could save to the point where you could pay for the majority of items on your own; again, saving you from too much extra debt or loans you might otherwise have acquired. Depending on certain aspects of your wedding, it’s not uncommon for people to plan out their wedding for an entire year. That’s a year of deciding on your perfect decor, multiple dress fittings and bookings, and praying that, come the big day, everything will go just as planned. Although there’s nothing wrong with that, that’s a large amount of time and potential stress you could go without. By choosing to elope, you’ll save yourself time for other things as a couple and individual. You’ll also keep yourself from any added stress. After all, life is stressful enough without adding to it. At the end of the day, whether you choose to elope or have a big ceremony, it’s really about what’s right for you as a couple. Like any decision it’s important to weigh the pros and cons and decide what’s important to you in the long-run. If you’d rather save money for different expenses or if you simply can’t afford a large ceremony, then eloping might be the best option for you. Extravagant or intimate, whatever you opt for, your day is bound to be special no matter what. 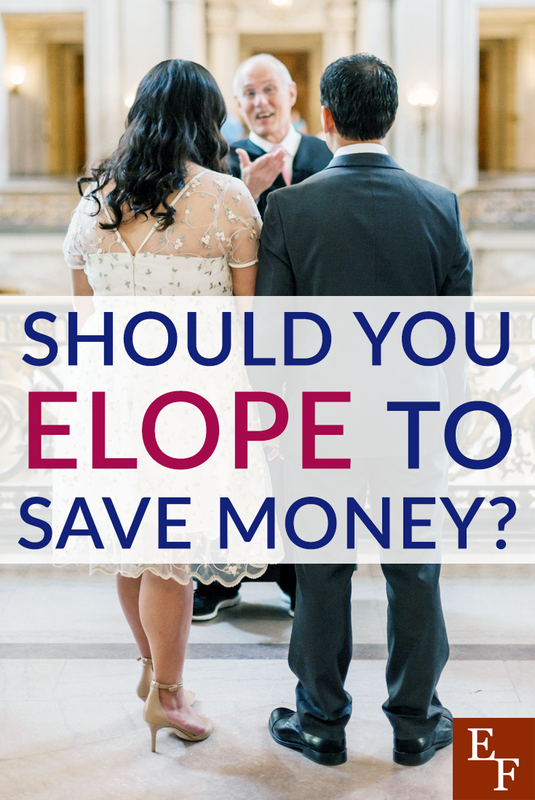 Would you choose to elope if it meant saving for other things? What are some of the reasons you might not elope? Eloping is a good choice for people that generally don’t like the idea of weddings. You could save so much time, not to mention the stress of having to make all sorts of decisions. To me, your wedding should be fun and a moment of happiness, and unfortunately it’s nothing but that. Not a fan of weddings because most nowadays don’t have a real meaning behind them. We just do them because we have to or because our parents want us to or because we want to raise some money. We often invite people we hardly know and will probably never see again so what’s the point?